Cinnamon sugar magic. Our soft almond cookie sprinkled with cinnamon and organic coconut sugar. Simply delicious! Quality real foods ingredients, and not too sweet! almonds, maple syrup, organic coconut oil, vanilla extract, arrowroot, sea salt, baking soda, organic coconut sugar, cinnamon. 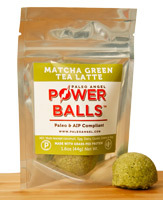 Portland Paleo believes that everything you consume impacts your health. We take pride in our desserts, and go to great lengths to ensure that each ingredient is beneficial to your body. Almonds, Agar, Coconut oil, everything in our cookies has something in it that’s good for you!